Sammy Rock aka Soul Oasis – C.E.O / Founder of Cyberjamz Radio/Records. DJ Sammy Rock, aka, Soul Oasis, hails from the Boogie Down Bronx and is highly respected for the integral role that he played in the evolution of dance music within the New York City nightclub scene. Sammy Rock emerged on the club horizon in the early eighties, spinning diverse sets blending, Disco, Salsa, and Freestyle grooves at various Bronx prominent nightclubs including the celebrated Chez Sensual,Peoples,Pieces and many infamous Latin Hip Hop hot spots across New York City. During the 2007 Winter Music Conference, Sammy Rock, spun his unique style of blending vocals and harmonies at the “Back To My Roots” party featuring Joey Madonia and legendary DJ Kenny Carpenter, one of the forefathers of the dance music movement, as well as, the 15 hour dance marathon (Room 2 of the venue) for the 16th Anniversary party of “The Shelter”, the longest running Underground House NYC party NYC featuring veteran DJ, Timmy Regisford and guest Deejays.There is just too much information to fit in this short bio. 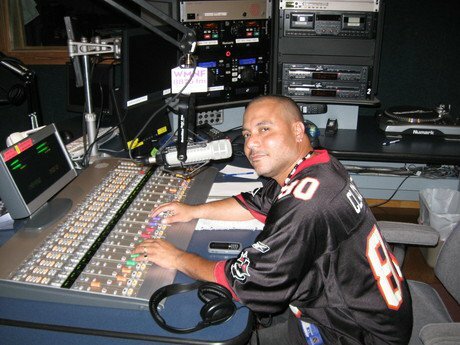 Sammy Rock has received international acclaim as owner and founder of his award winning Internet radio station Cyberjamz; the cutting edge web network specializes in underground dance music that launched in October 2004.One of the first internet radio station catering to undeground dancemusic and many other genres. http://cyberjamz.com is an extended network featuring music programmers that contribute live radio broadcasts from around the world, which also host web chat rooms, music news forums, DJ play lists, daily blogs, music archives, track reviews and interviews. In 2007, this multitalented artist launched Cyberjamz Records, which showcases tracks and releases from various aritst, which Sammy Rock has arranged and co-produced with other talented vocalist and producers.The catalog of over 91 releases are for sale at www.traxsource.com, the largest international digital download sites on the net. Click the link which will direct you to our catalog.